A super quick post today (mainly because it is getting late and I need to get to bed! lol). I totally forgot it was my boss’s birthday today and I’ve always given her a card for her birthday. I felt so bad even though I did actually wish her a happy birthday in person. So tonight, the plan was to make a birthday card. (Turns out I don’t actually make a lot of birthday cards so I need to remedy that too and put a few away for days like these). At first I thought I would use the WPlus9 stamp set Unforgettable as it has a couple of sentiments related to forgetting birthdays but when I sat down I decided to just make a regular birthday card. Materials used: Stamps – Unforgettable (WPlus9); Dies – Die-namics Blueprints 13, Landscape Trio (Mama Elephant); Cardstock – American Crafts, Knights Smooth; Designer Paper – Hello Sunshine (Lawn Fawn); Distress Inks, Copic Markers and Rhinestones (KaiserCraft). Hope you enjoyed my card! Thanks for stopping by today! Darling in every way, my friend, and sure to make your boss incredibly happy! I mean, look at that elephant, being carried away by the balloon, high above the clouds! Who would’t delight in such sweetness! I haven’t bought anything from WPlus9 in ages…may have to go for a stroll through the shop just to see what catches my eye! Perfect birthday card! 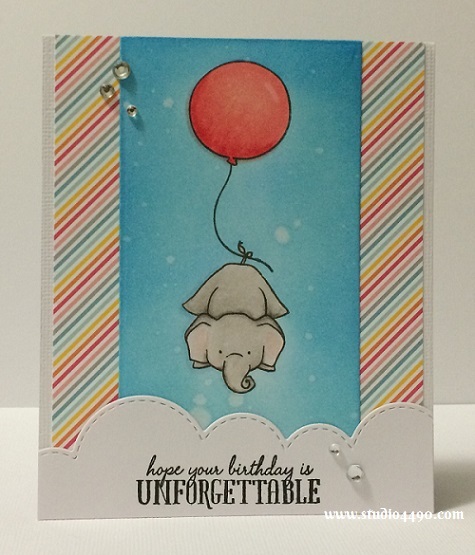 I love the way you used the stamp and the cloud die, not to mention the coloring on the elephant is just adorable!